11/07/2016Release 1.9.28.36, fixed a forecast issue and added 2016 support. 11/16/2015Release 1.7.27.10, updated the JQuery version. 04/03/2015Release 1.7.25.18, updated the weather service code. 12/10/2014Release 1.7.18.16, updated the weather service. 07/30/2013Release 1.6.8.26, updated the weather service provider's URL. 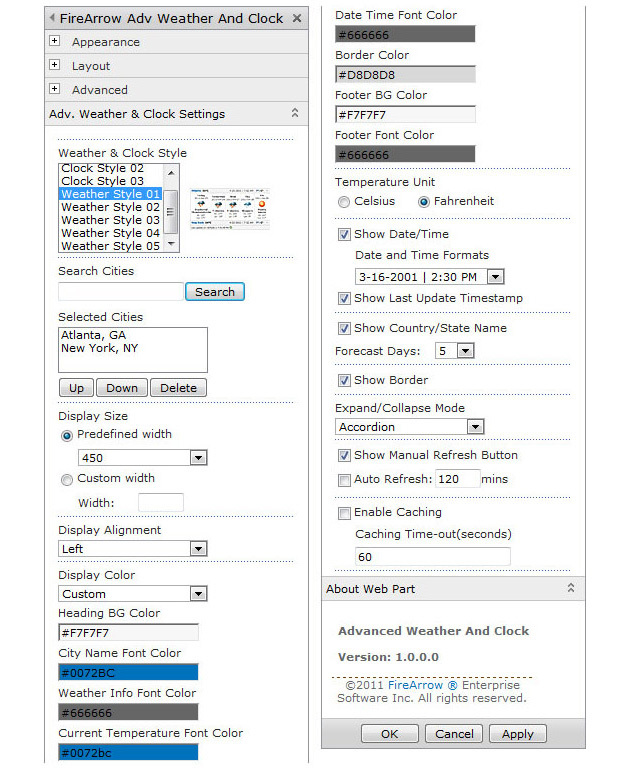 05/30/2013Release 1.5.6.8, enhanced navigation for tag and accordion styles. 01/27/2013Release 1.4.16.8, added i18n and 2013 support. 04/23/2012Release 1.1.14.16, fixed the datetime display issue caused by recent sp2010 patchs. 12/28/2011Release 1.1.12.25, improved the compatibility and fix some minor issues.